24 Easter Fire Christâ&#x20AC;&#x2122;s victory over death empowers the Church to heal and transform the world through the Holy Spirit. A fresco by Fra Angelico depicts the resurrected Christ meeting Mary Magdalene on Easter morning. Venerable Michael McGivney (1852-90) Apostle to the Young, Protector of Christian Family Life and Founder of the Knights of Columbus, Intercede for Us. HOW TO REACH US MAIL COLUMBIA 1 Columbus Plaza New Haven, CT 06510-3326 ADDRESS CHANGES 203-752-4210, option #3 addresschange@kofc.org PRAYER CARDS & SUPPLIES 203-752-4214 COLUMBIA INQUIRIES 203-752-4398 FAX 203-752-4109 K OF C CUSTOMER SERVICE 1-800-380-9995 EMAIL columbia@kofc.org INTERNET kofc.org/columbia ________ Membership in the Knights of Columbus is open to men 18 years of age or older who are practical (that is, practicing) Catholics in union with the Holy See. This means that an applicant or member accepts the teaching authority of the Catholic Church on matters of faith and morals, aspires to live in accord with the precepts of the Catholic Church, and is in good standing in the Catholic Church. Copyright ÂŠ 2019 All rights reserved ________ ON THE COVER Chaldean Catholic Archbishop Bashar Warda of Erbil blesses an image of Father Michael McGivney during Supreme Knight Carl Andersonâ&#x20AC;&#x2122;s recent visit to Iraq. still suffering Christians displaced from Mosul, one of the oldest Christian cities in the world, and listening to senior churchmen speak about the deteriorating situation of Christians entrusted to their care. There are hopeful images as well: the opening of McGivney House to provide apartments for young families and care for the elderly; the construction of a new Catholic hospital; and the activity of the newly established Catholic University of Erbil. These initiatives in housing, education and medical care are building an infrastructure to sustain Christian life. On a more personal level, I will cherish the painting I received from a young Yazidi boy helped at the medical clinic we support. It depicts a large sun shining down on a church, a mosque and a Yazidi temple, with a large Knights of Columbus emblem in the foreground. Another memory that will not soon fade is praying with young school children at Sts. Peter and Paul the Apostles Parish with the rosaries I presented to them as a gift from Pope Francis. There are many reasons the Knights of Columbus is so committed to our persecuted brothers and sisters. Yet perhaps it is as simple as this: We want a world where children can paint their pictures with bright colors and can recite their prayers together in peace. Vivat Jesus! LUCIEN BOTOVASOA loved to read stories from the lives of the saints, especially the martyrs, to his students in Madagascar. Children in his village, Vohipeno, are now told the story of Botovasoa, a husband and father who became a martyr of faith and charity. He was born in 1908, the oldest of nine children, and baptized at age 14. A talented student, athlete and musician, he was sent to the Jesuit college. He then returned to Vohipeno, where he married and taught at the parish school. He and his wife, Suzanne, had eight children, five of whom survived infancy. Known as a â&#x20AC;&#x153;happy man who made others happy,â&#x20AC;? Botovasoa was devoted to his family, his students and his faith. He directed the parish choir, helped lead a local religious group, and assisted the local priest. But he felt a desire to offer even more to God. In 1940, after reading the Rule of the Third Order of St. Francis, he became a Franciscan tertiary â&#x20AC;&#x201D; dressing in simple khaki clothes and living a spirit of sacrifice, poverty, fasting and prayer. Pope Francis Receives Supreme Knight in Private Audience Supreme Knight Carl Anderson presents Pope Francis with an icon of St. Jean Vianney during a private audience at the Vatican Feb. 28. The pope received Anderson on the last day of the Orderâ&#x20AC;&#x2122;s novena for repentance, renewal and rebuilding following the sexual abuse crisis. The image of the CurĂŠ of Ars was made by Fabrizio Diomedi and commissioned by the Knights of Columbus as part of another spiritual response to the crisis: the K of Csponsored pilgrimage of the saintâ&#x20AC;&#x2122;s incorrupt heart throughout the United States, which will continue until early June. During the audience, the pope and the supreme knight discussed other K of C initiatives, including the Orderâ&#x20AC;&#x2122;s support of displaced Christians in the Middle East. Learning that Anderson was traveling the next day to Erbil, Iraq, Pope Francis asked the supreme knight bring a supply of papal rosaries for the Christians in Erbil as a sign of the Holy Fatherâ&#x20AC;&#x2122;s prayerful union with them. kept away from their personal electronic devices.â&#x20AC;? Boil down the mounting data and you arrive at a simple conclusion: For the health of our children and our families, we need to place reasonable limits on screen time. We fathers, grandfathers, uncles or mentors sense this deep down, yet we may not know what to do. Hereâ&#x20AC;&#x2122;s a four-step plan: 1. Honestly assess your own media use. Yes or no: Is the smartphone the first thing you reach for in the morning and the last thing you look at before going to bed? Yes or no: Should you do with less screen time in your own life? If so, how can you begin to cut down? 2. If your phone or other digital device has become a sort of idol, you may need a sacramental solution, confessing to a priest and expressing sorrow over the fact that your excessive reliance on devices has taken time and attention from family, loved ones, prayer time and other religious obligations. 3. Given the powerfully addictive nature of technology, you may not be able to â&#x20AC;&#x153;just say no.â&#x20AC;? Take an incremental approach as you replace bad habits with good ones. In the coming week, as you focus on reducing your nonessential media use, implement a simple daily practice, such as a Morning Offering prayer, five minutes of Scripture reading, or a nightly examination of conscience. Ask God to give you a renewed love for these ways of spending time with him. 4. Picture your next interaction with an iGeneration young person in your life. Imagine that both of you have a smartphone in your hand. Set a great example by refraining from looking at the phone, and ask him or her to do the same. Make eye contact and let the conversation begin.â&#x2122;Ś SOREN JOHNSON is director of evangelization for the Diocese of Arlington and a member of Holy Family Council 6831 in Leesburg, Va.
FIND ADDITIONAL ARTICLES AND RESOURCES FOR CATHOLIC MEN AND THEIR FAMILIES AT FATHERSFORGOOD. ORG . Can hockey make the world better? The players and managers of the Flying Fathers think so. From left, Father Paul Patrick, Father John Perdue, Sister Mary Catherine Perdue (aka Sister Mary Shooter) and Father David Berezowski hit the ice to help revive the legendary Canadian charity team. Frank Quinn, second from right, managed the original team for decades; Barrie Shultz manages the new team. The new Flying Fathers continue the original teamâ&#x20AC;&#x2122;s tradition of â&#x20AC;&#x153;ordainingâ&#x20AC;? the gameâ&#x20AC;&#x2122;s first scorer as a bishop. In Parry Sound, Ontario, on Feb. 20, a member of the opposing team, the Eager Beavers, received the honor. â&#x20AC;&#x2DC;FOR A BETTER WORLDâ&#x20AC;&#x2122; The Flying Fathers team is made up of a mix of young priests and original Flying Fathers, including Father John MacPherson, 55, who played from 1988 to 2008. â&#x20AC;&#x153;We have a great dynamic going between the older original players and the new young guys,â&#x20AC;? said MacPherson, who serves as chaplain of Father Holden Council 5030 in Kentville, Nova Scotia. One new player is Father Kris Schmidt, 33, a priest in Fort Saskatchewan, Alberta, who flew in for the games with the permission of his bishop. a pope whose voice resonated with Catholic youth, he has been pleasantly surprised by the teamâ&#x20AC;&#x2122;s resurgence. â&#x20AC;&#x153;We have some great guys in their late 20s, early 30s,â&#x20AC;? said Quinn. â&#x20AC;&#x153;I think we have John Paul II to thank for that. I remember him speaking at World Youth Day [in Toronto] and saying, â&#x20AC;&#x2DC;God loves you.â&#x20AC;&#x2122; All the young people cheered, but then he wagged that little finger of his at them and said, â&#x20AC;&#x2DC;Yes, but God also expects a lot from you.â&#x20AC;&#x2122;â&#x20AC;? Father Justin Bertrand, 28, who is a priest in Fort-Coulonge, QuĂŠbec, sees playing for the new Flying Fathers as part of his vocation. â&#x20AC;&#x153;Our motto is playing and praying for a better world,â&#x20AC;? said Father Bertrand, a member of Fort-Coulonge Council 7221. â&#x20AC;&#x153;Father Les used to say, â&#x20AC;&#x2DC;A Flying Fathers game is a success when you see a grandfather bouncing his grandson on his knee and they are both laughing and smiling. â&#x20AC;Ś Save the family and you save the world.â&#x20AC;&#x2122; The Church, and the world, needs more good news. Thatâ&#x20AC;&#x2122;s why this is a beautiful thing to do.â&#x20AC;?â&#x2122;Ś MEGAN HOEGLER is a freelance writer based in Toronto. From left: Teammates Father Berezowski, Father Perdue and Father Patrick share a laugh at the rink. â&#x20AC;˘ An archival photo depicts â&#x20AC;&#x153;Sister Mary Shooterâ&#x20AC;? skating during a Flying Fathers game. Father Les Costello, behind sister in a hat, was ringleader of the original Flying Fathers for decades. â&#x20AC;˘ Father Daniel Janulewicz takes a pie to the face during the game in Parry Sound last February. been shot dead that day, and my mother had just got the news. So it was a very tense, sad and scary time. About three months later, I got out of school as normal, and my friends and I began to race along the bottom of the school playground. As we did so, we had to pass this British army lookout post. I was about 10 feet away from it when a soldier fired off a rubber bullet. The rubber bullet hit me on the bridge of my nose; I lost my right eye and I was left completely blind in my left eye. The next thing I remember, I was lying on the school refectory table. My music teacher, Mr. Giles Doherty, found me lying on the ground, and he carried me into the school refectory. And I remember him asking me my name; he knew me very well, but he wasn’t able to identify me because of the extent of the injuries. My nose was completely flattened, my eyeballs were down on my cheekbones, and my face was just a bloody mess. cession of the youth Mass.” I couldn’t believe it, but it was nothing compared to the excitement of my mother. When I told her, it was like the greatest honor that ever could be bestowed upon anybody. That day I was seated at the foot of the altar. And I could hear singing from the half a million young people there. When the time came for me to walk up, I was very nervous. My girlfriend then, Rita — she is my wife now — was with me as well, and as I began to go up the steps, I could feel the wind; I had this sense of being up very high. I could hear my name being announced, and then I met the pope, and he gave me a hug. It was a very brief moment, but it was like time had stopped. The pope gave me a hug, and somebody later said he had tears in his eyes. I will never be able to overexaggerate the significance of that embrace. The older I get, the more I realize how important that was. The fact that I was singled out in that way gave me a responsibility, I think. The work that I do today, my attitude toward life and my desire to make a difference in the world, I think in many ways has all been rooted in my faith and that experience of meeting John Paul. Richard Moore (center) meets in 2007 with the Dalai Lama (left) and Charles Inness, the British soldier whose rubber bullet blinded him. The Dalai Lama is the patron of Mooreâ&#x20AC;&#x2122;s charity, Children in Crossfire, and a personal friend. â&#x20AC;˘ Moore is pictured as a child, before and after the rubber bullet took his sight at age 10. Supreme Knight Carl Anderson stands outside the newly completed McGivney House with Chaldean Catholic Archbishop Bashar Warda of Erbil, Iraq. The church-run apartment building was constructed with support from the Order to serve displaced families and the elderly. THE â&#x20AC;&#x2DC;NOW OF GODâ&#x20AC;&#x2122; YOU, DEAR YOUNG PEOPLE, are not the future. We like to say, â&#x20AC;&#x153;you are the future.â&#x20AC;? No, you are the present. You are not the future of God; you young people are the now of God. He invites you and calls you in your communities and cities to go out and find your grandparents, your elders; to stand up and with them to speak out and realize the dream that the Lord has dreamed for you. Not tomorrow, now, for wherever your treasure is now, there will your heart also be. â&#x20AC;Ś For Jesus, there is no â&#x20AC;&#x153;meantime,â&#x20AC;? but only a merciful love that wants to enter into and win over our hearts. He wants to be our treasure, because Jesus is not a â&#x20AC;&#x153;meantime,â&#x20AC;? an interval in life or a passing fad; he is generous love that invites us to entrust ourselves. â&#x20AC;Ś In a special way throughout these days, Maryâ&#x20AC;&#x2122;s fiat has been whispering like a kind of music in the background. She not only believed in God and in his promises as something possible, she believed God himself and dared to say â&#x20AC;&#x153;yesâ&#x20AC;? to taking part in this now of the Lord. She felt she had a mission; she fell in love and that decided everything. May you feel that you have a mission, may you fall in love; the Lord will decide everything. â&#x20AC;&#x201D; excerpted from Pope Francisâ&#x20AC;&#x2122; homily at the final Mass of World Youth Day 2019. More than a half million people attended the Mass, which took place Jan. 27 at Campo San Juan Pablo II (St. John Paul II Field) in Panama City. Pope Francis is greeted by flag-waving pilgrims as he arrives for the World Youth Day vigil at Campo San Juan Pablo II Jan. 26. Knights from Panama, the United States and Canada gather at the Fiat Festival. Three councils in Panama City helped plan and execute the festival, the largest event for English speakers at World Youth Day 2019. â&#x20AC;˘ Bishop Robert Barron of Los Angeles (left) and a packed convention center pray before the Eucharist at the culmination of the Fiat Festival. each person there had been given a fiat before he or she was born: â&#x20AC;&#x153;God the Father spoke a fiat over you. He said, â&#x20AC;&#x2DC;Let there be you.â&#x20AC;&#x2122;â&#x20AC;? Auxiliary Bishop Robert Barron of Los Angeles, founder of Word on Fire Catholic Ministries, focused his remarks on oneâ&#x20AC;&#x2122;s identity in Christ. â&#x20AC;&#x153;The Christian spiritual life never begins with our achievements,â&#x20AC;? he said. â&#x20AC;&#x153;It never begins with our excellence. It begins with the invasion of grace. You find out what God has planned for you, [and] you are going to find life and life to the full.â&#x20AC;? magine Jesus’ disciples, huddled together in gloom and discouragement, when Mary Magdalene came bursting into the room at the break of dawn with the cry, “He is alive! He is risen from the dead!” For the early Christians, this joyous proclamation became the very heart of the Good News that their hearts burned to tell the whole world. They understood — as modern people often fail to grasp — that if Jesus is truly risen from the dead, that fact changes everything. The ancient world knew well that death is the most indisputable fact of human existence. The human mortality rate is, after all, 100 percent. Rich and poor, strong and weak, good and evil alike, all eventually go down into the grave together, leaving behind all their loved ones, earthly possessions, hopes, dreams and plans. The early Christians therefore recognized that if Jesus has risen from the grave, then it is not just a lovely miracle that happened to one person. Nor is it a resuscitation to earthly life like that of Lazarus, who would have to die again. No, in Jesus, the power of death has been broken. “O death, where is your victory? O death, where is your sting?” (1 Cor 15:55). The whole trajectory of human sin, sorrow, suffering and condemnation has been turned around. The curse has been reversed. with a courage, missionary zeal and supernatural power that they had never known before. Immediately, they began to proclaim the Gospel in the same way that Jesus had: not only with words, but with mighty deeds that demonstrated the truth of the words. They healed the sick, liberated those oppressed by demons, brought unity where there had been division, brought joy where there had been sorrow, and brought the light of truth where there had been idolatry and spiritual darkness. And the Apostles, through the sacraments, brought the forgiveness of sins and the birth of new citizens of the kingdom in baptism. It is no wonder that the Good News spread like wildfire across the ancient world and the Church grew exponentially, even during periods of severe persecution. The kingdom of God was visibly breaking in. OUTPOSTS OF THE KINGDOM Our goal in life is not only to get to heaven one day; rather, we are also called to extend the presence of the kingdom of heaven on earth. We need to draw upon that same power of the Holy Spirit with which Jesus himself was anointed during his earthly ministry. As disciples of Christ, our works of prayer, charity, and virtue, when motivated by the conviction that Jesus is truly THE OPEN HEAVENS alive, are acts that bear witness to the In Jesus’ own earthly life there was a power of Christ’s resurrection in the remarkable foreshadowing that helps ilN JESUS, THE POWER world. Every Catholic family, parish and luminate what would occur in his resurorganization is meant to be an “outpost rection. At the beginning of his public OF DEATH HAS BEEN of heaven,” where all those involved can ministry, Jesus was baptized in the Jordan experience something of the fearlessness, River by John. Even though John’s bapBROKEN. THE CURSE HAS joy and hope that come from knowing tism was a “baptism of repentance for the BEEN REVERSED.” Jesus’ victory over death. Indeed, the forgiveness of sins” (Lk 3:3), Jesus willKnights of Columbus, through its various ingly submitted to it as an act of proinitiatives — prayer campaigns, serving found humility and obedience to the those in need, defending religious liberty, Father. His decision to identify totally advocating for Christians at risk, and prowith sinners meant that ultimately he would have to go to the cross. Indeed, his going down into the tecting the rights of the vulnerable — are directly involved in takwater prefigured his death; Jesus later speaks of his death as a “bap- ing ground from the dominion of darkness and extending the presence of the kingdom of God on earth. tism” (Lk 12:50). Jesus foretold that such power would be at work in the Church Jesus’ coming up from the water, likewise, prefigured his coming up from the grave. What happened when he came up from the when he said to Peter, “I tell you, you are Peter, and on this rock I water? He was “praying, the heavens were opened, and the Holy will build my church, and the gates of Hades shall not prevail Spirit descended upon him” in the form of a dove (Lk 3:21-22). It against it” (Mt 16:18). Note that gates are not offensive weapons is noteworthy that the Gospel does not say that heaven then closed but defensive. Jesus is not saying that the Church would flee before back up again. The implication is that Jesus lived under an “open the power of hell but ultimately be rescued. No, the Church is on heaven.” Indeed, his mission was to bring heaven to earth. Jesus, an offensive campaign against sin, Satan and death. Even Hades in his human nature, had access to all the grace, power, mercy, itself (the netherworld or realm of the dead) will not be able to healings and blessings of heaven, and he distributed them on earth. withstand the witness of the disciples of Jesus, walking in the vicFrom that day, he was “filled with the Holy Spirit” and went “in tory of his resurrection. Its gates will be broken down and its capthe power of the Spirit” to begin his mission of making the king- tives liberated.♦ dom of heaven present on earth (Lk 4:1,14). What occurred at Jesus’ baptism parallels what would later hap- MARY HEALY is a professor of Scripture at Sacred Heart Major pen to the whole Church, gathered in the upper room after Jesus’ Seminary in Detroit and the author of Healing: Bringing the Gift ascension: As 120 disciples, including Mary and the Twelve, were of God’s Mercy to the World (Our Sunday Visitor, 2015). In 2014, praying, “a sound came from heaven… and they were all filled she was appointed as one of the first three women ever to serve on with the Holy Spirit” (Acts 2:2-4). The Holy Spirit imbued them the Pontifical Biblical Commission. Members of St. Michael the Archangel Council 10577 in Reno, Nev., helped move Father Tom Babu from his former parish in Stead to his new assignment in Carson City. The Knights assisted Father Babu in packing his things and then unloading them at his new home. Members from five Louisiana assemblies presented a Mass travel kit to Bishop Shelton Fabre at Mass at St. Francis Cathedral in Houma. Northwest Hennepin Council 11941 in Rogers, Minn., completed extensive renovations in a home adjacent to the St. Martin Parish that will serve as a new residence for the pastor. Council members spent more than 400 volunteer hours remodeling the kitchen and bathroom, installing new carpeting and hardwood flooring, gutting and refinishing the basement, installing new doors, and completing other projects. Archbishop Hennessey Council 959 in DeWitt, Iowa, purchased Catholic youth Bibles for the middle school students and teachers at St. Joseph School. The council has also helped the school organize prayer services and vocation talks. Stanley S. Hebert Sr. Council 8770 in Maurice, La., held a shrimp boil dinner fundraiser at the parish hall of St. Alphonsus Church. The Knights prepared and sold 650 dinners, raising $2,600 for Steps to Heaven, an organization that ministers to families who have suffered a miscarriage or lost an infant. The council also provides gowns for infants in the neonatal intensive care unit and isolette/incubator blankets for local hospitals. Members of Bishop Francis Marrocco Council 16233 in North York, Ontario, welcomed the Hannas, a Christian refugee family from Iraq. The Hannas found sanctuary at St. Edward the Confessor Parish in Toronto thanks to an immigration program co-sponsored by the parish and the council. 12!0(/ +0/2+1 ,.#2%1).+1'. %/$". Abnaki Council 334 in Augusta, Maine, was asked by the pastor of St. Michael Catholic Parish to help move an elderly parishioner from a structurally unsound home to an assisted living center. The Knights worked with other St. Michael ministries to move the woman to a safer situation. In the process, they also facilitated a reunion with her estranged son, who joined in to help. Members of St. Paul Council 10775 in Inabanga Bohol, Visayas, worked with parish volunteers on the home of a family in need in Barangay Lutao. The group provided walls and roofs as part of this project throughout the Diocese of Talibon. parochial vicar of Holy Spirit Catholic Church in Duncanville. After Council 8157 voted to cover the construction costs, a parishioner anonymously donated half the funds. St. John the Baptist Council 14898 in Longmont, Colo., and Longmont Council 1313 collected 3,375 pounds of food and $470 in donations for the 9Cares Colorado Shares food drive, a community initiative to collect food and toiletry donations for needy families. The Knights collected the food at area grocery stores and presented the donations to the St. John the Baptist Food Bank. headband sales to replace wornout books in the school library. Assembly 307 donated an additional $250 toward new copies of beloved stories to help students develop literacy and enjoy reading. Bishop William R. Johnson Council 9487 in Lake Forest, Calif., has sponsored a recycling program for more than 25 years, earning nearly half a million dollars since its inception. Most recyclable items are donated by parishioners at a daily drop-off spot and during a big collection every month. Council 9487 donates funds raised through the program to the parish and to charity organizations such as the Food Outreach Program and Maryâ&#x20AC;&#x2122;s Shelter, a home for women who are pregnant or have just given birth. Arthur U. Joyal Council 4225 in Dracut, Mass., held its first â&#x20AC;&#x153;oldiesâ&#x20AC;? dance at the Lowell Veterans of Foreign Wars hall, which drew more than 300 people and raised over $2,700 for council-supported programs and charities. During the dance a winner was drawn in the councilâ&#x20AC;&#x2122;s raffle; the prize was a week at a vacation home in Florida, generously donated by a member. St. Louis de Montfort Council 11137 in Santa Maria, Calif., held its seventh annual car show to support Catholic schools and youth programs â&#x20AC;&#x201D; and in a bonus this year, a member of the council won a red Corvette during the fundraiser. The last six fundraisers raised more than $23,000 for scholarships. Harry Mackey of Holy Family Council 6099 in Chattanooga, Tenn., grills hamburgers and hot dogs for the St. Stephen Catholic Church Fall Family Picnic. The Knights volunteer every year for the event, serving some 400 parishioners. from its worst weather in 15 years. Father Timothy Werner Council 2860 in Cut Bank helped distribute the food staples to the Browning pantry as well as the food pantry of Little Flower Parish, which serves the Blackfeet Indian Reservation in northwestern Montana. The councilâ&#x20AC;&#x2122;s donation funded a 15-passenger van and a septic system for the home, after the previous van was wrecked and a septic system failure took all but one restroom out of commission. Council 12107 previously donated some $6,000 to the ministry. St. Norbert Council 12107 in Paoli, Pa., raised $49,000 for St. Josephâ&#x20AC;&#x2122;s House, a ministry in East Fallowfield to provide a loving home for children of drug-addicted parent, as well as those who have been in foster placement for years, have histories of abuse or are suffering from attachment disorders. St. Maryâ&#x20AC;&#x2122;s Council 14010 in Altus, Ark., held a lunch fundraiser to defray medical costs for the father of a local family, who had suffered an accident that left him paralyzed. Thanks to door donations and money collected from a raffle and auctions, the Knights presented the family with $14,000. Members of St. Susanna Council 10272 in Mason, Ohio, presented $6,000 to St. Joseph Home of Cincinnati, a nonprofit ministry offering a home to adults and children with developmental disabilities. The council raised the funds at its third annual Classic Car & Truck Show. More than a dozen councils collaborated to put on an annual benefit dinner for InnerVisions HealthCare in West Des Moines, Iowa. The most recent dinner raised more than $25,000 to support the clinicâ&#x20AC;&#x2122;s life-affirming ministry and medical care for people facing unplanned pregnancies or sexually transmitted diseases. Vincent T. Lombardi Council 6552 in Leonardo, N.J., established a monthly support group meeting to help caregivers and family members of people with special needs. The meetings include quarterly seminars on topics such as guardianship, 529A savings plans and education law changes. The first meeting drew so many people the Knights had to seek a larger space in the parish to host everyone. Our Lady of La Salette Assembly 3115 in Shallotte, N.C., hosted a fundraising dinner for Homes for Our Troops, a charity that builds specially donates and adapted custom homes for severely injured veterans. Council members created and marketed the event, set up the meal, and cleaned up afterward, while its associated women’s group served the food. Attendees were invited to donate personal hygiene items for residents of the Fayetteville VA Medical Center. The dinner netted more than $2,000. Robert Keeling of Pope John Paul II Assembly 3293 (left) and Past Grand Knight Kevin Loughney of St. Joseph Council 10627, both in High Bridge, N.J., stand on a bridge over Interstate 78 with a newly replaced American flag. Council 10627 has flown flags on the interstate since the 9/11 terrorist attacks. Assembly 3293, Our Lady of Lourdes Council 6930 and St. Catherine of Siena Council 15703 partner with St. Joseph Council to fund and maintain the flags. Knights from across northern Virginia clean the Korean War Veterans Memorial in Washington, D.C. In collaboration with the National Park Service, 52 Knights, plus family and friends, washed the Memorial Mural Wall and its surrounding walkway and cleaned the 19 stainless steel statues representing an ethnic cross-section of America and all the branches of the military. Rock Creek Council 2797 in Bethesda, Md., collected items for wounded service members and veterans at Walter Reed National Military Medical Center. In conjunction with the American Red Cross, council members conducted the drive for more than a month, gathering used books, snacks, toiletries, toys, clothing and gift cards. Bishop Charles P. Greco Assembly 2147 in South Plainfield, N.J., held its annual luncheon and bingo game at the Menlo Park Veterans Memorial Home. More than 20 former servicemen of World War II, the Korean War and the Vietnam War enjoyed a gourmet menu and prizes donated by Knights. Members of Assumption Council 5252 in East Islip, N.Y., put in more than 900 hours of work organizing a 5K run/walk, which raised $25,000 to benefit Long Island veterans. Mrs. Ellen Lonneman, librarian at St. Therese School in Southgate, Ky., accepted a flag from Faithful Navigator Bill Kopp and Former Master Carl Biery of Bishop Flaget Assembly 307 in Covington, Ky. The assembly donated a flag for display in the school library as a sign of patriotism. open to students from local schools. The winning contestants, who wrote on the theme “What the American Flag Means to Me,” received cash prizes totaling $200 and flag kits containing American flags and the materials for installing them at home. After the award presentation, the winning students participated in a flag disposal ceremony conducted by the Assembly 1900 officers. IN THE UNITED STATES THE ENGLISH COMPANY INC.
1-800-444-5632 www.kofcsupplies.com IN CANADA ROGER SAUVĂ&#x2030; INC.
OFFICIAL APRIL 1, 2019: To owners of Knights of Columbus insurance policies and persons responsible for payment of premiums on such policies: Notice is hereby given that in accordance with the provisions of Section 84 of the Laws of the Order, payment of insurance premiums due on a monthly basis to the Knights of Columbus by check made payable to Knights of Columbus and mailed to same at PO Box 1492, NEW HAVEN, CT 06506-1492, before the expiration of the grace period set forth in the policy. In Canada: Knights of Columbus, Place dâ&#x20AC;&#x2122;Armes Station, P.O. Box 220, Montreal, QC H2Y 3G7 ALL MANUSCRIPTS, PHOTOS, ARTWORK, EDITORIAL MATTER, AND ADVERTISING INQUIRIES SHOULD BE MAILED TO: COLUMBIA, PO BOX 1670, NEW HAVEN, CT 06507-0901. REJECTED MATERIAL WILL BE RETURNED IF ACCOMPANIED BY A SELF-ADDRESSED ENVELOPE AND RETURN POSTAGE. PURCHASED MATERIAL WILL NOT BE RETURNED. OPINIONS BY WRITERS ARE THEIR OWN AND DO NOT NECESSARILY REPRESENT THE VIEWS OF THE KNIGHTS OF COLUMBUS. SUBSCRIPTION RATES â&#x20AC;&#x201D; IN THE U.S.: 1 YEAR, $6; 2 YEARS, $11; 3 YEARS, $15. FOR OTHER COUNTRIES ADD $2 PER YEAR. EXCEPT FOR CANADIAN SUBSCRIPTIONS, PAYMENT IN U.S. CURRENCY ONLY. SEND ORDERS AND CHECKS TO: ACCOUNTING DEPARTMENT, PO BOX 1670, NEW HAVEN, CT 06507-0901. 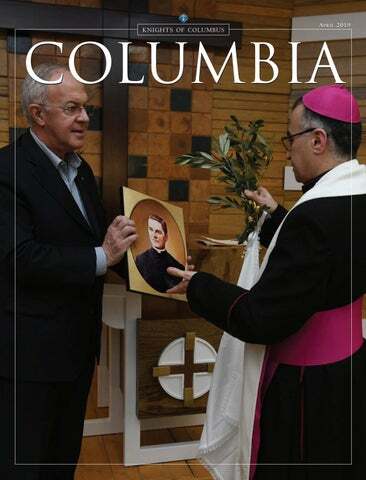 COLUMBIA (ISSN 0010-1869/USPS #123-740) IS PUBLISHED MONTHLY BY THE KNIGHTS OF COLUMBUS, 1 COLUMBUS PLAZA, NEW HAVEN, CT 06510-3326. PHONE: 203-752-4000, www.kofc.org. PRODUCED IN USA. COPYRIGHT ÂŠ 2019 BY KNIGHTS OF COLUMBUS. ALL RIGHTS RESERVED. REPRODUCTION IN WHOLE OR IN PART WITHOUT PERMISSION IS PROHIBITED. PERIODICALS POSTAGE PAID AT NEW HAVEN, CT AND ADDITIONAL MAILING OFFICES. POSTMASTER: SEND ADDRESS CHANGES TO COLUMBIA, MEMBERSHIP DEPARTMENT, PO BOX 1670, NEW HAVEN, CT 06507-0901. CANADIAN POSTMASTER â&#x20AC;&#x201D; PUBLICATIONS MAIL AGREEMENT NO. 1473549. RETURN UNDELIVERABLE CANADIAN ADDRESSES TO: KNIGHTS OF COLUMBUS, 50 MACINTOSH BOULEVARD, CONCORD, ONTARIO L4K 4P3. PHILIPPINES â&#x20AC;&#x201D; FOR PHILIPPINES SECOND-CLASS MAIL AT THE MANILA CENTRAL POST OFFICE. SEND RETURN COPIES TO KCFAPI, FRATERNAL SERVICES DEPARTMENT, PO BOX 1511, MANILA. rancia is moving with greater ease and independence after a Feb. 15 visit from a group of Knights of Columbus to her home in SahagĂşn, Mexico. A delegation from the California State Council presented a new wheelchair to the teenage girl and her grandmother, who cares for Francia while battling cancer. It was one of 560 chairs that California councils recently donated to rehabilitation patients in Mexico through the Orderâ&#x20AC;&#x2122;s partnership with the American Wheelchair Mission. The California Knights personally delivered chairs to three children at their homes in small towns north of Mexico City. â&#x20AC;&#x153;They just were so happy that we were there, that we thought about them,â&#x20AC;? said California State Deputy Joseph Salaiz. Bishop Kevin Vann of the Diocese of Orange accompanied the California Knights and their wives on the trip. â&#x20AC;&#x153;It was really a blessing that he was with us,â&#x20AC;? said Salaiz. â&#x20AC;&#x153;Everywhere we went in Mexico, people were coming up to him asking for blessings.â&#x20AC;? The Knights also distributed several dozen chairs at the rehabilitation center CRIT Hidalgo; the Centro de RehabilitaciĂłn e InclusiĂłn Infantil TeletĂłn provides care for children and adolescents with physical disabilities through a model centered on the family. Most of the donated wheelchairs were given to the Hidalgo center and to another CRIT location in Guadalajara. The Order has worked with the American Wheelchair Mission, as well as the Canadian Wheelchair Foundation, since 2009. !" ""!"
! "	"! "! Knights of Charity Every day, Knights all over the world are given opportunities to make a difference — whether through community service, raising money or prayer. We celebrate each and every Knight for his strength, his compassion and his dedication to building a better world. Members of Our Lady of Fatima Council 9636 in Las Piñas, Manila, Philippines, and their families join the Our Lady of Fatima parish youth group at the annual Luzon South Walk for Life in Parañaque City. Council Life Director Toti Valdez and Family Director Michael Villanueva led the young people in marching to protest violence to the unborn and drug-related extrajudicial killings. TO BE FEATURED HERE , SEND YOUR COUNCIL’ S “K NIGHTS IN A CTION ” PHOTO AS WELL AS ITS DESCRIPTION TO : C OLUMBIA , 1 C OLUMBUS P LAZA , N EW H AVEN , CT 06510-3326 OR EMAIL : KNIGHTSINACTION @ KOFC . ORG . PLEASE, DO ALL YOU CAN TO ENCOURAGE PRIESTLY AND RELIGIOUS VOCATIONS. YOUR PRAYERS AND SUPPORT MAKE A DIFFERENCE. I was raised in a loving Catholic family, yet it wasnâ&#x20AC;&#x2122;t until I joined the local parish youth group that my faith came alive. Led by our youth minister to pray before the Blessed Sacrament, I encountered a God who knew and loved me intimately, and I dreamed about becoming his bride and serving him in the poor. In high school, my life was filled with studies, sports and friends. After graduating from Villanova University, I worked as an oncology nurse while also dating a man I could see myself marrying. I seemed to have it all, but I couldnâ&#x20AC;&#x2122;t forget what God had placed deep in my heart as a 15-year-old. The immense joy and peace I experienced contemplating a religious vocation led me to leave everything and follow in our Lordâ&#x20AC;&#x2122;s footsteps. My first convent visit was with the Franciscan Sisters of the Renewal, whose charism is to evangelize and to serve the poor. My heart was captured. Godâ&#x20AC;&#x2122;s dream for me came true on June 6, 2016, when I professed my final vows and became a bride of Christ forever!